The uniformed patrol officer is the backbone of the Huntington Police Department. Patrol officers are typically the first point of contact with the public. The core function of the Patrol Bureau is crime suppression and prevention through uniform presence and response to E911 calls for service. The Patrol Bureau also serves as the training and proving ground for new police officers. Upon completion of the West Virginia State Police Academy, probationary police officers (PPOs) must successfully complete a comprehensive 10 week field training program. Each PPO is instructed, evaluated and mentored by very talented, hand selected training officers. The Traffic Unit is comprised of five officers assigned to traffic related duties. The Traffic Unit’s assigned officers complete 20% of the departments total crash reports and account for 31% of the total citations issued. The Traffic Unit also facilitates road races (such as 5Ks, marathons, run/walks), parades, dignitary escorts, and traffic control for Marshall University home football games. In 2010, the Traffic Unit also conducted its first Police Motorcycle Operators Course, training our own personnel as well as two Cabell County deputies. The Traffic Unit was also recognized by the WV Governor’s Highway Safety Program and selected to participate in a pilot program for evaluating the effectiveness of three-wheeled motorcycles for traffic enforcement. The unit was selected to function as the control group in this study because of our established utilization of conventional motorcycles, and was granted $50,000 for two new Harley- Davidson police motorcycles and related equipment. The K-9 Unit’s primary responsibility is the support of patrol operations and drug enforcement activities. Two of the K-9 officers are credentialed through the FBI Task Force, allowing them to assist other local, state and federal law enforcement authorities in the area. 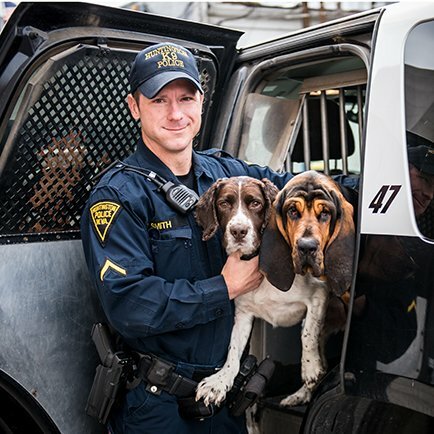 The unit currently has five certified K-9 handlers and five dogs, four being dual-purpose tracking/apprehension and narcotics detection and one being a single purpose tracking bloodhound. The Special Emphasis Unit (SEU) works closely with our citizens to identify and solve problems that are not easily remedied by traditional patrol responses. These officers conduct numerous vice and prostitution operations throughout the city. The SEU’s quick response to prostitution and drug complaints has had a tremendous effect on several crime “hot spots” in our city. They also partner with our various task forces providing additional manpower for undercover operations. This unit is responsible for the enforcement of the ordinances of the City of Huntington that pertain to Graffiti, Drainage, Junk Storage, High weeds and grass, abandoned vehicles, and external garbage and rummage. The HPD Maritime Patrol Unit was formed in April of 2013 and the Isaac H. Mitchell Patrol Boat was launched in May of 2013. This units responsibilities include providing search and rescue response along the Ohio and Guyandotte Rivers, enforcement of State of WV maritime laws, and to provide support during special events along the Riverfront. Average HPD Patrol Officer Earned $52,000.00.